Green Gobbler is an Ultimate Main Drain Opener, Drain cleaner and Hair Clog Remover that works with Main Lines, Sinks, Tubs, Toilets, Showers, Kitchen Sinks in fixing the clogged and messy drains. Green Gobbler is absolutely safe for Pipes & Great for Toilets. one can use it to get rid of clogged drains as it does not have any sepcial instructions to follow. One of the most common problems faced by every homeowner at some point in time is that of a “clogged drain”. Clogged drains can happen in homes with some of the best plumbing systems. There are many ways to remove clogs include home remedies and use of powerful drain cleaners like the Green Gobbler main drain opener. Let’s take a look at why drains really get clogged in the first place. It is essential to know the causes as this will enable you to minimize the problem. Clogs are caused over a period of time. There are several factors that contribute to the need for using drain cleaning products and one of the key factors is soap buildup. Soap buildup is most often seen in secondary drains like lavatory, shower areas, and even in drains in the laundry area. Normally, the soap water that you feel flows down the drain pipe is harmless but what actually happens is that it accumulates on the walls of the drain pipe over a period of time thus reducing the diameter of the pipes. Apart from soap buildup, hair and grease are also important causes of clogged drain. Grease buildup usually takes place in the kitchen drainage system and is caused by oils and fats. Green Gobbler™ is being developed by EcoClean Solutions, a cleaning and maintenance Supply Company based in Farmingdale, New York. EcoClean Solutions was established in 2002 and Green Gobbler was initially introduced specifically to cater to the professional maintenance customers across the globe. The use of this product was directed at commercial spaces including apartment buildings, office buildings, and restaurants. Today, due to the ever increasing popularity, the Green Gobbler™ is being made available directly to the consumers for household use. It has been created using proprietary and unique blend of natural ingredients, which are in accordance with the green guidelines as specified by the Environmental Protection Agency (EPA). The ultra thick formula of Green Gobbler main drain cleaner clings to the drain pipes to ensure the main lines, shower drains, and kitchen drains are free of clogs. The proprietary formula ensures clogging particles including hair, grease, soap, paper, organic matter, and oil gets completely dissolved. Its production process does not generate any waste and this odorless product is non-corrosive in nature. Non-corrosive and it will not damage the pipes. Great for toilet and safe for septic systems. The internet is home to several types of drain cleaning solutions and some are being marketed as the most superior clog removers but is that the truth? In reality, this is a type of product that needs to be used in order to understand whether it will deliver the desired result or not. There are many consumers out there who have tried most of these so called “superior cleaners” and complain that their drains are still clogged. Some people have tried natural home remedies and other environmentally friendly solutions like using the vinegar and baking soda blend, boiling hot water, and even plungers but the result remains the same – drains are still clogged! In such a scenario, how does the Green Gobbler rise up to the challenge? It works great and that also in minutes! Pour 1 Quart or 32 oz (half of the 64 oz jar) into the drain that needs to be cleaned. It starts working on impact but it is recommended to allow it to work for at least 30 minutes. You can then wash it off using warm water. It simply liquefies or emulsifies baby wipes, paper, grease, soap scum, organic matter, toothpaste, shampoo, and almost everything that is stuck there in your drain pipe. 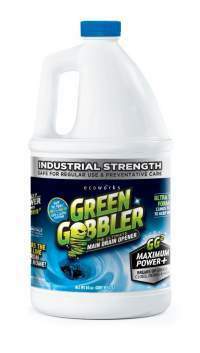 The good thing about green gobbler is that it did not have any harsh chemicals in it. All you need to do is a little bit of rinsing and that was all that it took to clear the shower drain. Are you wondering how the Green Gobbler is a better clog remover than any of the other products out there? Monosodium Sulfate: It is also known as a monobasic sodium sulfate and is an inorganic compound. It is often used as an inert drying agent. Monosodium sulfate along with a proprietary mixture of other non-hazardous ingredients form the key ingredients of the Green Gobbler. It is especially because of the proprietary ingredients that the Green Gobbler is able to efficiently clean clogged drains on a day-to-day basis. The effectiveness of Green Gobbler in cleaning out some of the toughest clogs is a fact as there are many consumers who have put up their youtube videos on how they managed to get rid of some really nasty and stubborn clogs. Due to its proprietary formula, this magical solution is able to completely dissolve grease, hair, feminine products, and paper within 30 minutes although for tougher clogs it needs to sit in there overnight. The only way you can actually see that happen is when you grab a jar for your shower drain! The good news is that Green Gobbler main drain cleaner can be used in both plastic and metal pipes as it is non-corrosive in nature. The Green Gobbler main drain opener is available in a 60 oz handy jar that will help in getting rid of some of the toughest clogs. They are also available in the form of drain opening pacs that contain the same highly potent ingredients but in the form of powder. Our verdict is that where everything else seems to have failed, the Green Gobbler works almost perfectly. This is one really powerful clog remover and works especially well on those hardened clogs.